So... I just played as my S1 Eruptor in SuperChargers for the very first time. When the first images of Lava Lance Eruptor came out I really noticed how much polished the textures were and how the character himself generally looked better. I know the image is from SWAP Force but... Simply because the model is the exact same one. Was it really that difficult to make the old Eruptor look like the "new" one minus the jacket, helmet and lance...? My old characters which I bought back in 2011, in a Triple Pack, a couple months after SA came out is apparently not good enough to be compared to his biker buffoon version. That's why I think revamps are bad: not because they are good but because they are so good the devs forgot to make their older counterparts as good. Don't think Terrafin suffers from the same problem (even if Gill Grunt has "derpy" eyes unlike his Deep Dive version) but... I don't really know what else to say. Can someone do a graphical comparison between the two? Don't know if Lava Lance Eruptor is out yet, honestly. It is kinda dumb. Some models got facelifts from TT or at least some touchups on their textures, but you have a character that someone's bound to compare to the older versions and don't do anything to those? It wouldn't be a problem if they all looked good but those textures look like jpeg saved on MS Paint compared to the new one. I mean, they kinda looked cool when SWAP Force was revealed (I was blown away by Euptor's new look during the announcement's gameplay) but really can't be compared to Lava Lance's. They are just so damn polished and high-defined and perfectly suit the character. The fact is I was absolutely sure he would have looked that way and was really excited and then... "Born to Burn!". If anything keep the old textures for the revamp as well! This only shows how they were incredibly busy developing the revamped SuperChargers and then simply ported the older characters without touching the majority of them (they shrunked Trap Masters, altered some animations and adjusted some textures and I think that's it). I... Honestly don't see that much of a difference, aside from the helmet and lance. And besides... That other screenshot's from Swap Force. Golden Queen did nothing wrong and she is best evil waifu. I know but as I said, it doesn't matter because that's the exact same model Eruptor has in SuperChargers. Well... "Old" Eruptor looks like a low-defined caly sculpture with a glowing effect under it. Lava Lance Eruptor looks really made out of solidified lava, has some nice black-ish shadings and overall look much more polished. Hey---300 characters...I can forgive this kind of stuff. I'm so used to mix results across the board for the last several games it's hard to get worked up about it...but I get it. Eh, in my opinion they look pretty great. Yeah it would have been nice to update Eruptor's previous textures, but it wouldn't be fully needed. Besides from what it looks like, BBPF doesn't have his high res fur that OG Pop Fizz has, same goes for DDTH, but then again, he's wearing a costume that takes up a majority of his body. When ever you get scared or nervous about something, you gotta do your best to keep on smiling and Go Beyond Plus Ultra! Don't forget that with pictures like the first one you posted of LL Eruptor, the details, texture quality, etc. is bumped up for a better presentation compared to how it looks when the game runs. Nuttin' special about Lava Lance Eruptor except for his new abilities. Well, when a lot of the game is the figures we buy and them "coming to life" in the game, TFB and VV should put forth a bit more effort in polishing the whole package. Don't show one thing and then go lazy and actually release a lesser product. PSN: GatorShea Feel free to add me if you play on either the PS3 or PS4. Drek is just overly ranting about reposed/revamped/rereleased figures. As usual, he ignores the simple business implications and the fact that the highest value no LC/alt figures from giants and swap force are reposes, Terrafin and Gill grunt always sell well, and that players new to the series need a shot at snagging all the characters featured heavily on back pack, story books, and lunch boxes as those are the images they are constantly looking at. Yes, they needed to clean up some of the models more, but that has NOTHING to do with 8 reimagined figures. Put Lightning Rod on the portal and tell me he couldn't have used a tune up. This is just part of the problems facing skylanders in the future in general, which is why lower figure counts in the future are a must, and the less silly crap the better. The sidekicks and elites are so much more of a cash cow travesty then re-imagined toons (legitimately keeping fan and dev favorites fresh), I have no idea why you've spent hours upon hours complaining about them is 2700 different topics. Glad heroic challenges are gone. Imagine doing 165 per skylander. That's 27225 challenges. No thank you. 'Business implications' are never an excuse to keep a bad texture in a game where you reworked similar characters. It wasn't just the gimmick-reposes, some old characters got entirely new textures in some parts,new effects,etc. The entire point of them was 'look at the old character,now look at the cool new outfit and moves'; well the reaction was bad because I look at them and see that they decided to do the new outfit at expense of the old guy. Well I guess explaining my motivations and not simply saying "they are bad because they are bad" isn't enough to make it a simple constructive critic. Because that's what it is. I may say you willingly accept whatever excuse to make money the devs will throw at you as long as it revolves around "new cool things for old guys"... But who am I to judge what you think? Let's make a game entirely out of revamps and kill what this series is about entirely, then. Guess what, fan favorites can remain fan favorites even if you don't keep reposing/revamping them each single year and really... Terrafin and Gill Grunt...? I hear Sunburn, Voodood, Rip Tide, Boomer and so on... And they were never touched again (if not for ridiculously expensive Elites). They could create new fan favorites instead of keep pushing the same old ones at the cost of making them overused. 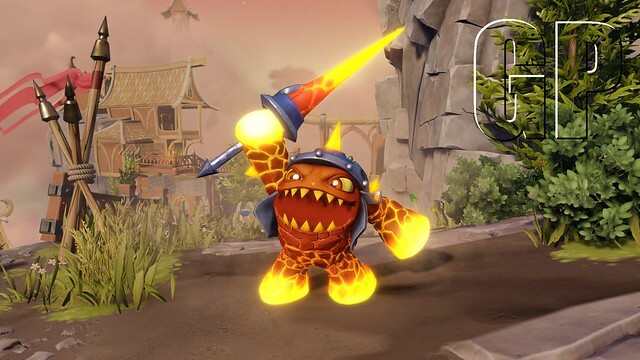 Have ideas for old Skylanders? Add them in-game as extra upgrades for old fans. Want to release again new characters? Ok, but do not exaggerate please. Even the "less characters" concept is very debatable. Less is fine but not like this year. Recapping what I touch on in my third paragraph is just.........please read my whole post be firing trying to tell me I'm wrong as you are mis-quoting. "Business Implications" were addressing the fact they reposed period, something Drek needlessly losses his mind over. Other characters were neglected as well, which is sloppy and needs to be addressed. They all should have been touched up. Getting 8 brand new characters would not have changed this versus 8 revamped characters which was the point Drek was making. His complaint about all older models is valid. His conclusion it's because they revamped characters is misplaced, bias, and ignorant. Not exactly. If they just slapped a wow pow and called it a day, it would've saved up some time for polish like this.Of course,that's bring the question of a new character not taking up that time, but it depends if VV has backburner designs like TFB or not. In theory,it would take longer to design a gimmick-repose because you need to make sure everything fits the original character in terms of anatomy,theme,and whatnot. Believe me, it's easier to make a whole new thing than to work over someone else's design ._. Of course that wouldn't have changed! I think you are missing my whole point (or maybe the exact opposite, you got it and we are both not understanding each others). 20 or 18 true brand new characters would have been simply that, brand new characters. Look at S2/3/4; they don't look any better than their S1 versions. How could I have complained about new Eruptor's textures if he didn't existed? If the only available reference was his regular form...? I can't complain about Eruptor's textures when looking at Hot Head's. Hope I worded myself better this time. However I admit they are really small changes and it's truly nitpicking (I simply can't get over the fact they have to change things without actually making them better but whatever...). Plus I can't compare, say, High Five to his SuperCharger version unlike Eruptor, so I guess that's fine and I simply preferred how he looked and played in Trap Team. You probably have 2-3 character designers....and their job is well...mess with 'em. I think the NPC's specially Caly, Flynn, Buzz, Tessa and Megs looks in the SC-PS3/WiiU/Xbox360 version ingame (not cutscene) graphics, worser as their TT-PS3/X360/WiiU counterparts. "If I had any humanity left, I would have been crushed by the guilt by now." Uh don't mind me. The new outfits are great and they look pretty much the same to me. Their fur seems a bit blockier but at least it's consistent. I mean their graphic models not the new outfits. I think also they look great. The graphics don't look any different to me, I just said it. Went from X360 to WiiU too so there should've been a difference. On Xboxone they are markedly better then Xboxone TT.